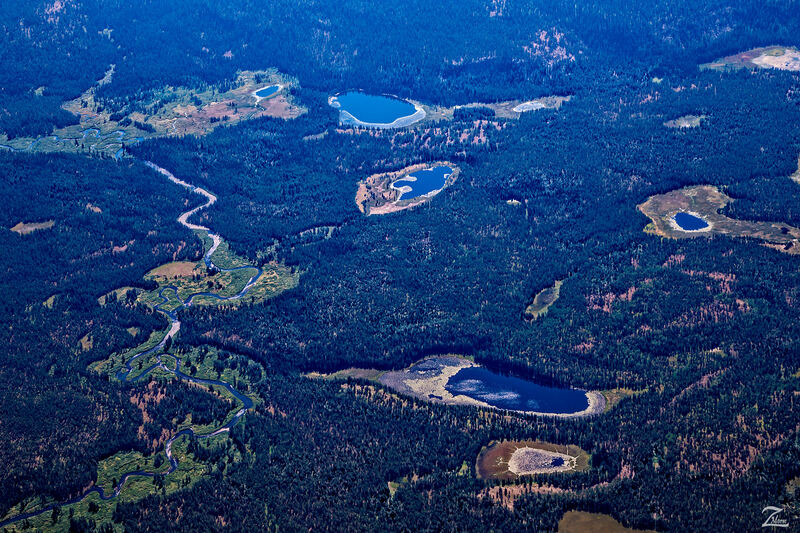 These remote wilderness lakes and streams are part of the Winegar Hole Wilderness and the Caribou-Targhee National Forest on the border with the Yellowstone National Forest in Wyoming. This area is just to the north of the Grand Tetons and to the west of Jackson Lake and Jackson Hole. Open the image full screen to see this beautiful wilderness area! The Winegar Hole Wilderness was designated specifically to provide high-quality habitat for the grizzly bear. Part of the Greater Yellowstone Ecosystem, this Wilderness is located on the southern boundary of Yellowstone National Park in western Wyoming. The low rolling hills with numerous wetlands, meadows, and streams is volcanic in origin. A forest of lodgepole pine, Douglas fir, subalpine fir, and Engelmann spruce covers much of the area. The area is managed as a trailless area to provide maximum security for the grizzly bear except for one short trail that provides access to Yellowstone National Park.